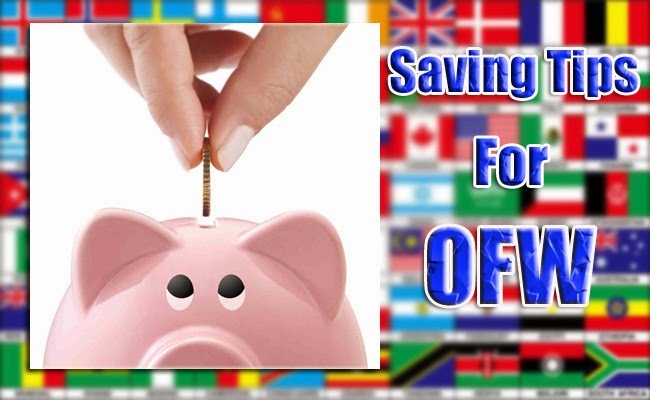 Saving up as an OFW can be a real challenging task. Settling abroad can cost much and most OFW chuck their salaries not for themselves but for their family. Saving money ca be hard as there are usual things to pay and sometimes emergencies that you are expected to handle. So how can you save up for the future? Setting a goal keeps you focus in saving money. Set goals like buying a car or a house. Make it SMART. A goal must be specific. You must be able to measure to see if you had attained it already. Have some parameters like are you just aiming for a house or a fully furnished one? Is it attainable or possible with your current salary? It is realistic? Set a time limit, an actual time. It could be months or years. Talk you your family about your plans so they can also help you keep on track. You can split your salary in envelops or jars. Label them as bills, savings and others. Other use different ways to save money. You can make as many as you want or need. Saving money can be made into a habit. In a study, if you continue to do something in 21 days, it will become a habit. If you have a jar, you can put in some cash everyday, then take it in your bank every month. Try investing as there are a lot of options when an OFW invests. It does not have to be a big one. You can start in a small amount at first and then gradually increase it without hurting your financial responsibilities. Many OFWs share that they still look forward if a retirement in the Philippines. If you want to go back to Philippines, invest in plans such as retirement plan, insurance and others. These plans will help you in your future needs. Isn’t it great to have something ready if a need arise? If you are saving up for something, try hard not to use the money in something that can be avoidable. Unnecessary expenses might be a tumbling block towards your dream. Keep yourself focus on the goals.